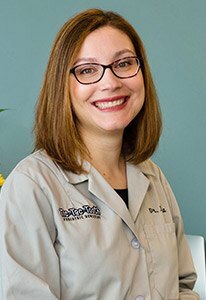 Dr. Jiana grew up in the Northwest Suburbs of Chicago and studied at the University of Illinois at Chicago where she received her Doctorate of Dental Surgery degree in 2008 and Bachelor of Science in Dentistry in 2006. Prior to that, she received her Bachelor of Science in Biology and minors in Chemistry and Spanish from the University of Illinois at Urbana-Champaign in 2004. For Dr. Jiana, dentistry allows her to bring together all the things she loves: science, creativity, problem solving and most of all providing an important needed service to the community. She has lead dental office teams in school settings and also has treated patients in family practices and walk-in clinics. Dr. Jiana loves working with children and does a great job making them feel comfortable in the dental office! Dr. Jiana lives in LaGrange, IL with her husband and three children Vasi, Eleni and George. In her free time she enjoys baking, visiting family and traveling. Dr. Jiana is a member of the American Dental Association, Chicago Dental Society, Illinois State Dental Society and the Seattle Study Club.